320 Main proprietor Jason Schiffer. 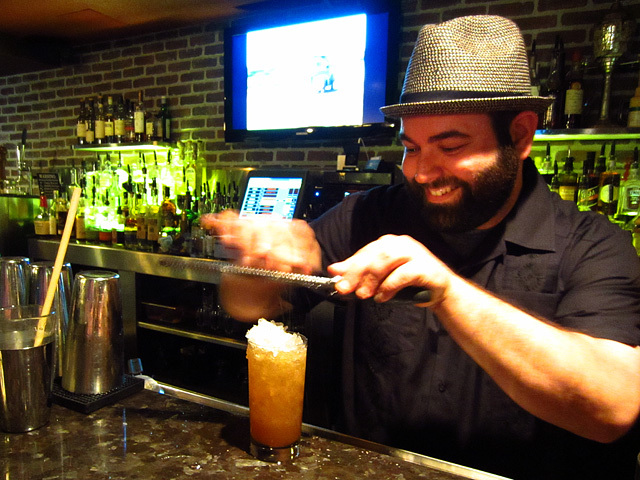 A few weeks ago, 320 Main became an enchanting Tiki room for several hours when the popular Seal Beach restaurant hosted its first Tiki Night on Memorial Day. 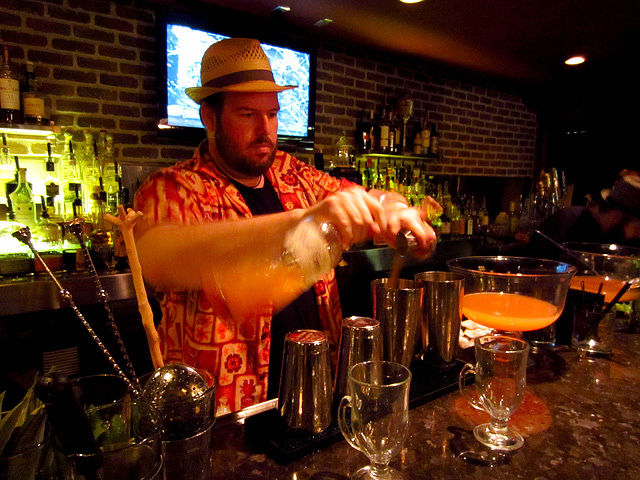 Inspired by Blair Reynolds’ Tiki Nights at the Teardrop Lounge, 320 Main proprietor Jason Schiffer, Matt Robold (RumDood) and LA’s own Marcos Tello (1886) are teaming up to present a SoCal series of Tiki Nights on the last Monday of every month. RumDood is in the zone. 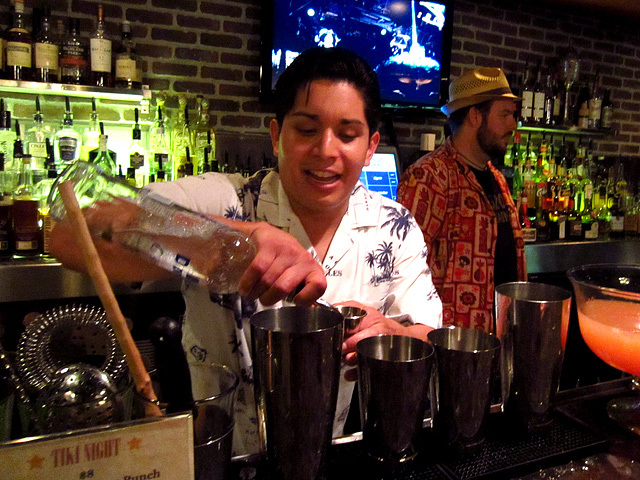 Tiki aficionados and cocktail enthusiasts from parts north and south convened at 320 Main for the debut Tiki Night, including Chuck Taggart (Looka! 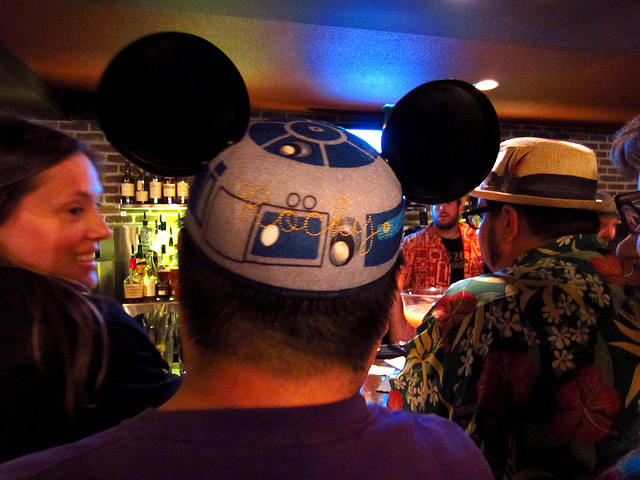 ), celebrity barback Tatsu Oiye, TikiGeeki and Dave Stolte (Home Bar Basics). A steady flow of guests throughout the night ensured that the trio behind the bar was kept busy mixing drinks, no small task given the complexity of some of the cocktails. 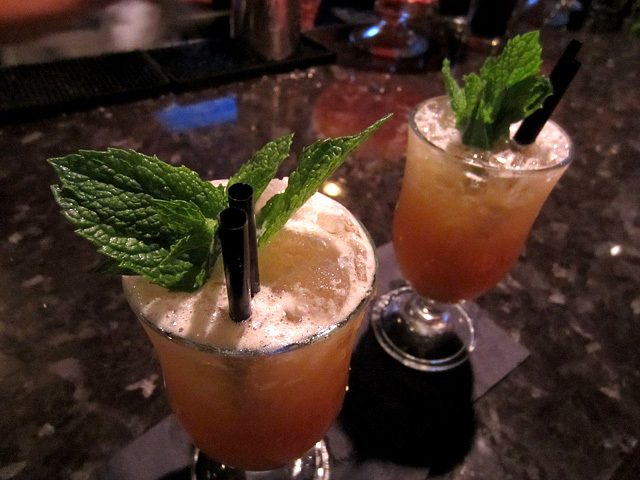 To kick off the Tiki Night series, 320 Main featured a menu of selected Tiki classics. 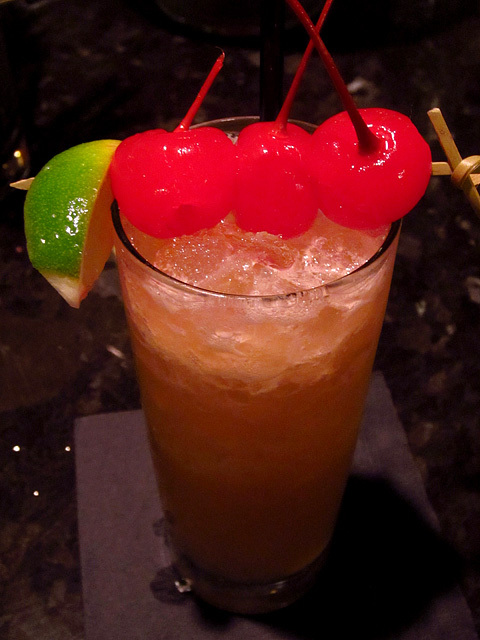 Since it was Memorial Day, I naturally started with the Three Dots and a Dash (“Victory” in morse code): DonQ Gold Rum, Rhum Agricole, lime juice, orange juice, honey syrup, falernum, Allspice Dram and Angostura bitters. As fine a version as I’ve ever had, no surprise considering it was Tello who made it. 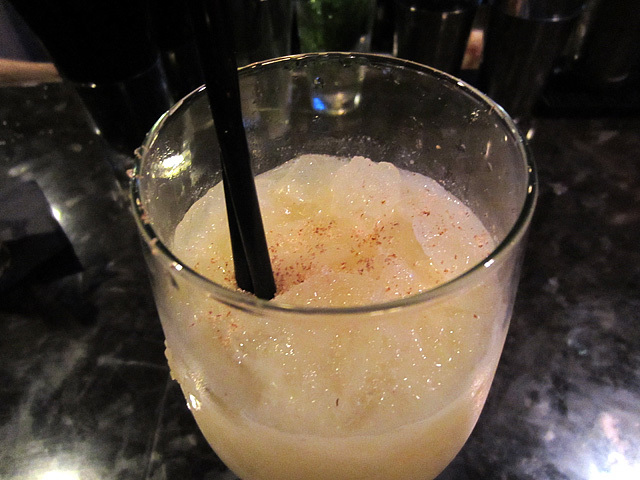 Next was a Painkiller PKNY, made with DonQ Añejo, Cream de Coconut, pineapple juice, orange juice and freshly grated nutmeg. 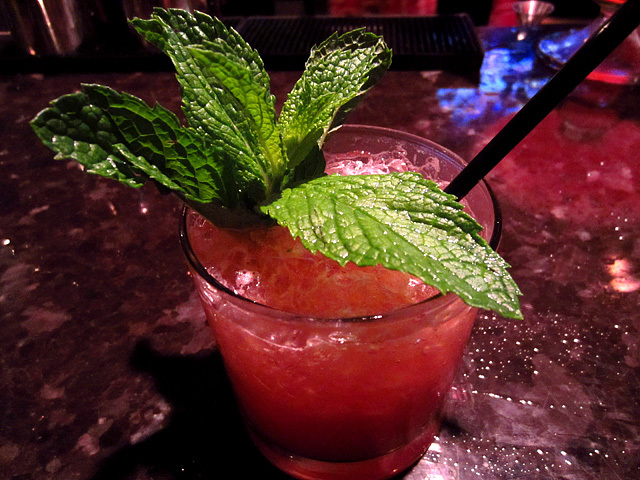 A refreshing take on the Caribbean original, created by Daphne Henderson at the Soggy Dollar Bar. 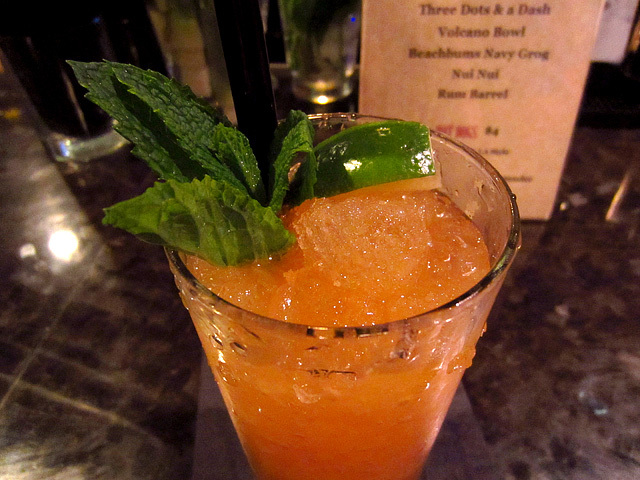 Nui Nui: Dark Jamaican Rum, Allspice Dram, vanilla syrup, cinnamon syrup, lime juice, orange juice, Angostura. 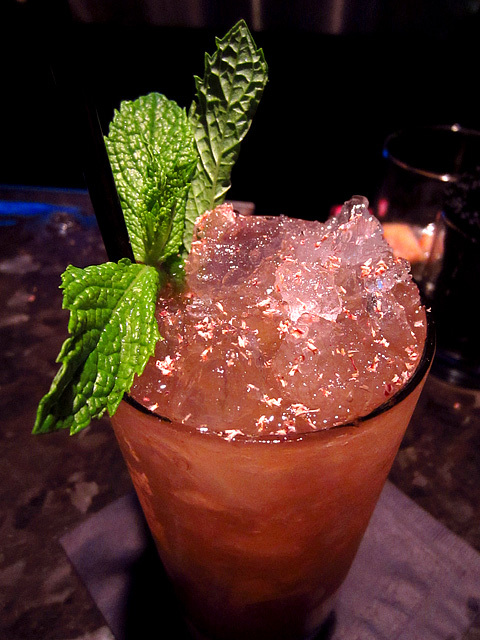 Rum Barrel: DonQ Cristal, DonQ Gold, Demerara 12-Year, Falernum, Allspice Dram, honey mix, lime juice, grapefruit juice, orange juice, pineapple juice, Pernod Absinthe, grenadine, Angostura. 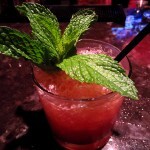 Jamaican Planter's Punch: Jamaican Rum, Falernum, grenadine, lime juice, simple syrup, mint and nutmeg. 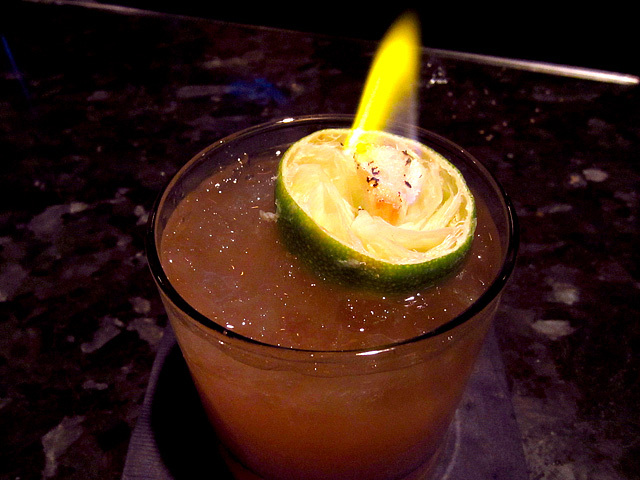 It wouldn’t be a night in Polynesia without a fiery Volcano Bowl: DonQ Gold, Demerara 12-Year Rum, Jamaican 12-Year Rum, grapefruit juice, lime juice, maple syrup, simple syrup and a float of Overproof Demerara. Of course this was a single-serving version of the classic, which is usually shared by a few thirsty imbibers. If Rocky Yeh is there, it must be the happiest place on Earth. The session finished on a particularly tasty note when Schiffer offered up a Bumbo, featured on 320 Main’s special $5 Tuesday cocktail menu: Coruba Dark, 320 Falernum, Allspice Dram, cane syrup and lime. If requests for more sips were any indication, the delicious Bumbo was the unofficial winner of the night; superb at any price, and dangerously good at just $5 on Tuesdays. 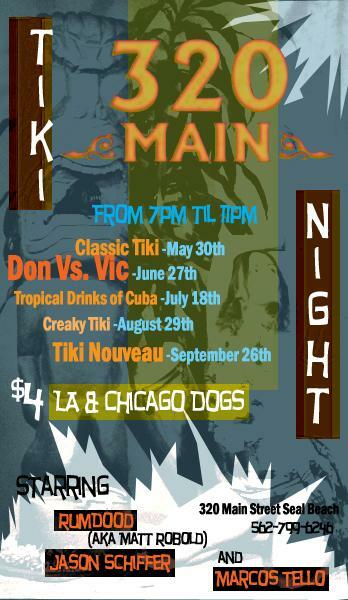 The next Tiki Night is on Monday, June 27th and it promises to be a doozy: Don vs. Vic, an epic showdown between the cocktails of Don the Beachcomber and Trader Vic. 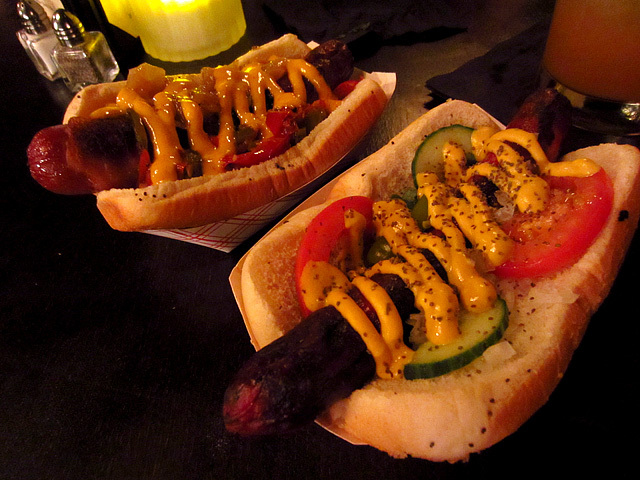 On Tiki Night, 320 Main offers LA (L) and Chicago-style hot dogs. To pair with the Tiki goodness, the kitchen will once again serve LA and Chicago-style hot dogs for $4 each. And if all of that wasn’t enough, 320 Main is also holding a raffle in conjunction with the voting! Everyone who casts a vote for one of Don or Vic’s drinks has a chance to win a prize, including: a bottle of Appleton 12-Year Rum; an authentic Martinique swizzle stick; a 320 Main $25 Gift Card; a bottle of Lemon Hart 151; or a Tiki mug with $100 worth of 320 Main drink chips. Raffle winners will be announced at 10pm and must be present to win.